WASHINGTON, D.C. - Family Research Council (FRC) Action recently released its annual scorecard for the First Session of the 115th Congress. U.S. Rep. Bruce Westerman (R-Ark.) is among a new record of 245 Members of Congress who scored a perfect 100 percent for votes cast last year. He was recently presented with FRC Action's "True Blue" award for displaying unwavering commitment and consistent support of faith, family, and freedom. 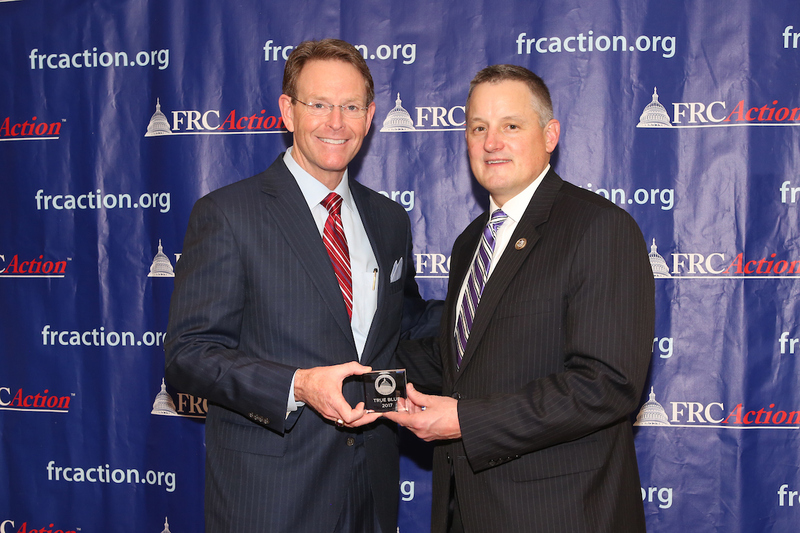 "We thank Rep. Westerman for consistently voting to defend and advance faith, family and freedom. As a 'True Blue Member' he voted 100% on FRC Action's Scorecard including votes to repeal and replace Obamacare, deliver long-needed tax cuts that are already providing much needed relief to working families, stand for religious liberty, overturn President Obama's transgender military policy, end the forced partnership between taxpayers and Planned Parenthood, and protect pain capable babies. "Rep. Westerman deserves praise for his unwavering commitment to stand for life, family, marriage, and religious liberty. Arkansans should be encouraged to know that they have a Member of Congress such as Rep. Westerman who has come alongside other members and our president to begin the work of rebuilding our nation, and protecting the very values that made America great," concluded Perkins. "When I ran for Congress, I made a commitment to stand for family values. Since taking the oath, I have lived up to that commitment by supporting life at all stages, beginning at conception. I have voted against taxpayer-funded abortions and I have voted to repeal and replace Obamacare. Supporting Arkansas families means allowing them to save and spend more of their hard-earned money. That is why I voted for the Tax Cuts & Jobs Act, which nearly doubles the standard deduction for families and nearly doubles the child tax credit. My commitment to families will not waver. As I continue my service, I will continue to stand for the hardworking families of the Fourth District of Arkansas. I thank Family Research Council for this award."